Apply with spatula to cover hairline cracks and small concrete divots and imperfections. 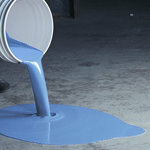 Poxypaste can be used by itself or prior to applying a floor coating. Floor is ready for use shortly after application. Apply indoors or out to horizontal or vertical concrete and masonry. @ 70F: Light Traffic: 10-24 hours. Pre-measured 2 gal kit for easy application; Components Include: 1 gal Part A (resin), 1 gal Part B (hardener) - volumes approximate. Garon Poxypaste™ is approved for shipping to all 50 states by ground or air.